1. Book of Unforgettable Journeys (Conde Nast Traveler). We gave this as a present and now I want to read it too (and that cover, it's beautiful). 2. Kitchen Confidential by the amazing, crazy Anthony Bourdain. 3. The Help. Before the movie comes out! 4. French Women for All Seasons. Almost finished enjoying this and cannot recommend Mireille Guiliano's books enough (just be sure to read the first one first). oh! I'm always in need of a good new book. Thanks for the suggestions! The Help is a great read. I love The Help so, so much. I think I might need to re-read it this summer... and then go see the movie! I'd really like to try the French Women books, too. Thanks for reminding me! Kitchen Confidential is a great read. Anthony is hilarious. It does have a lot of profanity in it, though. Now, I curse like a sailor, but always feel the need to warn others about it in a book. He also reads the audio book version, which is terrific, so long as there are not little ears around! The Help was just so heartbreaking and wonderful - you will love it. I have been reading a lot this summer and love it. I also listen to a book a week on CD while I work - if you haven't tried it, you must! Some of them are so well done. I need to read The Help! Summer is absolutely the best season for reading. The Help was such a good book - I literally couldn't put it down! :) And I LOVE all of Marielle Guiliano's books - I've read all of them just because I love the way she writes (and of course, her whole philosophy of life! :). I just finished The Help and could not put it down! Its such a great book - I had no idea they were making a movie off of it! I totally just watched both of the trailers :)! The Help was honestly one of the best books i have ever read. i'm nervous to see the movie fearing they will ruin the story line. it's a must read. Okay I need to get The Help ASAP! Summer reading has commenced and I am loving it. I LOVED The Help! Enjoy yourself in these books! French women don't get fat has been on my list forever! Like you I make up for my reading in the summers and from what everyone is saying here, i've got to go get The Help pronto! I love Anthony Bourdain! 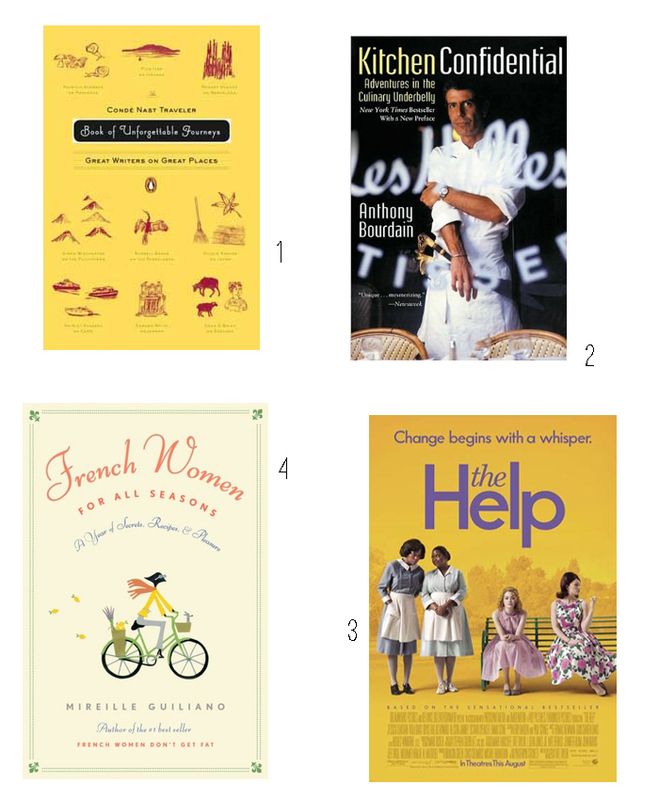 And The Help is on my to-read list before the movie, too. Summer reading is the best! I'm reading the Help and need to get to the rest of these!